Make a favorite with this classic egg salad recipe. 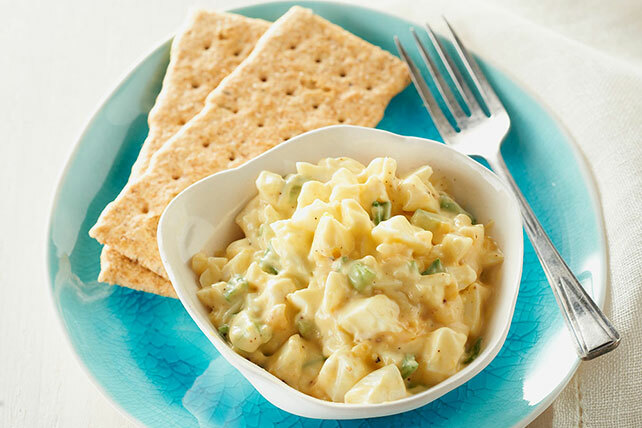 With Dijon mustard and finely chopped celery and green onions, our Classic Egg Salad is sure to please. Place eggs in medium saucepan. Add enough water to cover eggs by 1 inch. Bring to boil. Remove from heat, cover. Let stand 15 min. Use slotted spoon to transfer eggs to bowl of ice water. Let stand 5 min. Peel eggs; shred with rotary grater. Place in medium bowl. Add remaining ingredients; mix well. Prepare using GREY POUPON Hearty Spicy Brown Mustard. If you don't have a rotary grater, chop the eggs with a knife instead. 4 servings, about 1/2 cup each.